EU has adopted an ambitious agenda for climate action and has complied by the 2012 deadline with its commitment under the Kyoto protocol to reduce its GHG emissions by 8% as compared with their 1990 levels. In 2007 the EU adopted a climate and energy package with the goal to reduce its GHG emissions by 20% by 2020 (against 1990 levels), and further targets have been set for 20% of EU energy consumption to come from renewable resources, and 20% reduction in primary energy use compared with projected levels to be achieved by improving energy efficiency. The EU Intended Nationally Determined Contribution (INDC) to the United Nations Framework Convention on Climate Change (UNFCC) formally put forward a binding, economy-wide target of at least 40% domestic GHG emissions reductions below 1990 levels by 2030 which is corresponding to the longterm vision towards a low-carbon economy in the EU as described in the 2050 Roadmap. 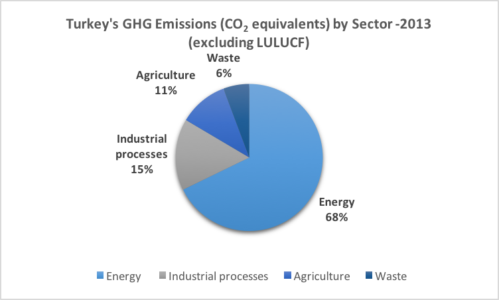 "Turkey's INDC expresses 'Up to 21% reduction in GHG emissions from the Business As Usual (BAU) level by 2030." In the Instrument for Pre-Accession Assistance (IPA) Planning Document, it is stated that "The objective in this sector is for Turkey to fully comply with EU environmental and climate change legislation upon accession requiring adoption of all relevant Directives and legislation, including the necessary investments." One of the indicators to measure developments towards this objective is "Development of measures to mitigate and adapt to climate change, with convergence towards EU requirements and mainstreaming of climate change considerations into other sector policies." It is envisaged that the proposed project will be a motivation for taking into account climate change issues into buildings, transport, waste and agriculture sectors by determination of costs and emission mitigation potentials and development of analytical basis for a long term low carbon development strategy, to reconcile climate, growth and energy security, and eventually to contribute to sustainability of these sectors. Will be an important initial step to comply with EU legislation and the goals and intentions of the Paris Agreement. Turkey does not have emission reduction targets under Kyoto Protocol, but national communication documents have been prepared and submitted by the government since becoming a party to the convention. Among Organization for Economic Co-operation and Development (OECD) and UNFCCC Annex 1 countries, Turkey's GHG emissions per capita are the lowest in terms of histrorical responsibility and primary energy consumption per capita. Eenrgy related GHG emissions per capita in 2009 were 3.7 tonnes of carbon dioxide (CO2) equivalents (OECD average was 10.6 tonnes and the world average was 4.4 tonnes). Turkey has developed the "National Climate Change Strategy" (NCCS) in order to contribute to global efforts to reduce the impacts of climate change, taking into account its own special circumstances and capacity. A National Climate Change Action Plan (NCCAP) was published in July 2011, including strategic principles and goals on GHG emission control and adaptation to climate change 2011-2023. The objectives of the NCCAP include the reduction of primary energy intensity by 20% compared to 2008 by 2023, and an increase of the share of renewable energy in electricity production is to be ensured. The NCCAP includes goals and actions on energy, buildings, transport, industry, waste, agriculture, land use and forestry, climate change adaptation, and cross-cutting issues.